How about making a realistic crocheted water lily (or lotus blossom) arrangement as a beautiful decoration or table centrepiece? Make as many leaves and blossoms as you need to fill your space! Water Lily is an original crochet pattern by June Gilbank. 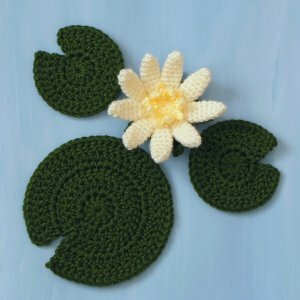 Pattern includes full instructions with step by step photos and clear illustrations at every stage, so you can easily crochet your own Water Lily.With two different leaf sizes, you can create an aquatic arrangement with as many leaves and blossoms as you want. The blossoms are fairly time-intensive, but the leaves work up in minutes! Yarn: DK weight yarn in white, cream or pink for the petals (note: you may substitute worsted weight yarn if desired; the blossom will be about 1/2 inch wider if you do); worsted weight yarn in dark green, and yellow or orange. Date Added: 09/07/2012 by Nishant m.
Date Added: 04/22/2012 by Chrisie M.
Date Added: 07/27/2010 by Heather L.